We propose a simple ultraviolet (UV) sensor consisting of a conventional single-mode optical fiber capped with an azobenzene-moiety-containing polymer. The UV light changes the dimensions of the azobenzene polymer, as well as the refractive index of the material. 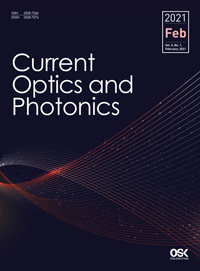 Incident light with a wavelength of 1550 nm was reflected at the fiber/polymer and polymer/air interfaces, and interference of the reflected beams resulted in spectral interference that shifted the wavelength by 0.78 nm at a UV input power of 2.5 mW/cm2 . The UV sensor’s response to wavelength is nonlinear and stable. The response speed of the sensor is limited by detection noise, which can be improved by modifying the insertion loss of the UV sensor and the signal-to-noise ratio of the detection system. The proposed compact UV sensor is easy to fabricate, is not susceptible to electromagnetic interference, and only reacts to UV light.